Stories about cycling and impotence are old hat. 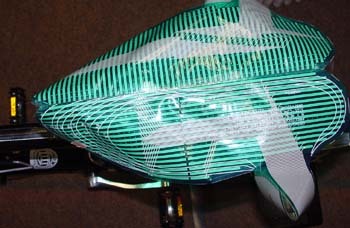 Readers may remember the blaze of publicity which surrounded Irwin Goldstein's 1997 article in Bicycling magazine, and its subsequent extinction amid accusations of faulty experimental technique. Stories come and stories go, but the idea that long periods in the saddle can mess with your sexual health is long-established. It goes back at least as far Hippocrates' report on the Scythians, and has since cropped up wherever people use horses--or bicycles. It is the kind of folk wisdom to which you pay attention, if you have any sense. Back in June, BBC news ran a feature about a new European report on the subject. A brief spot on the lunchtime news was enough to tell us that it was careful and well-supported. Better still, it dealt with female as well as male problems. Figuring that it would be worth sharing with 63xc.com readers, we did a couple of sessions of serious Googling and got hold of a copy for the office. This isn't a proper review. The 63xc.com editorial team lacks medical qualifications, and we're in no position to pick a fight with a bunch of scientists. Instead, we're going to introduce you to the key players and talk you through their conclusions, then offer some oblique comments from an offroad FG perspective. The report is hard to summarise because it isn't a conventional scientific paper. It takes the form of a multilingual DVD with 3D animations, video footage of experiments in progress, and filmed interviews--a kind of urologists' party mix. Pro cyclists Gilberto Simoni and Fabiana Luperini both make cameo appearances, the latter to the editor's particular delight. But most of the participants are doctors and medical researchers, all of whom have published on the subject in hand. Several of these source documents are included in PDF format. The report kicks off with some fairly stark statistics. Professor Froböse of the Deutsche Sporthochschule and his colleague Dr Straudte report the findings of a survey of some 4600 club riders, mostly men. A staggering 94% claimed to suffer some form of cycling-related pain. 60% had genito-urinary symptoms, everything from occasional numbness to complete erectile disfunction (impotence). Think it's different for girls? Professor Luc Baeyens, of the Centre Hospitalier Universitaire Brugmann in Brussels, would beg to differ. He's a gynaecologist specialising in sports medicine, and the study he published in the British Medical Journal suggests that chronic swelling, numbness, skin infection and lymphatic damage are widespread among female cyclists. In fact, an informal study he carried out among a small group of competitive racers suggests that the incidence of such problems among serious riders may be as high as one in six. Froböse states categorically that any man cycling more than 400km a week is at increased risk of impotence, and Baeyens' female pros are doubtless in a similarly high-risk category. But plenty of people manage those mileages without ill-effects, while others damage themselves on 20 mile Sunday outings. Why the difference? Ask Rodano and Sommer. Rodano, of the Centre of Bioengineering at Milan Polytechnic, led a three year study on bicycle saddles. He characterises three points where rider makes contact with saddle: two of bone, one of flesh. The bone points are the ischial tuberosities, protrusions off the base of the pelvis. The third, the apex of the triangle, is the soft tissue between your legs. Now, you can put as much pressure as you like on the ischials--they're built for it. But the soft tissue is another matter. The soft tissue is where all the blood vessels and nerves which supply your genitalia--male or female--are routed. Pressure here will constrict the blood vessels or deaden the nerves. The longer the pressure is maintained, the greater the risk of lasting damage. Dr Sommer, a urologist the University of Cologne, puts Rodano's findings into historical context. He notes that the stretched-out riding position which has become fashionable over the last couple of decades has tended to shift weight from the ischials forward onto the soft tissue, and he claims that this has led to an increased incidence of cycling-related G-U health problems. Sommer teamed up with Froböse to devise experiments to support his claim. Working with a sample group of male and female volunteers, the pair used a sensor network to monitor saddle pressures and blood flow to the --ah-- extremities during 30 minute sessions on a stand-mounted bicycle. The tests were repeated with many variations-- saddle type, posture, bike geometry, workout intensity and so on. The results were broadly as expected but produced some surprises too. As Sommer predicted, posture is extremely important. The more the rider leans forward, the worse the effects on their plumbing. That simple fact will surprise no-one, but the associated statistics are an eye-opener. According to Sommer, a cyclist with his or her upper body at 30° to the horizontal may experience a 70% reduction in genital blood supply. Ouch! The saddle turned out to be important too. The primary requirement for comfort is that it is broad enough to support the ischials properly--and that's not just for women. But there is also a need to support the soft tissue. This bucks market trends. Since the Goldstein article, manufacturers have been selling 'cutaway' saddles, claimed to keep weight off the pubis. According to Froböse and Sommer these are downright dangerous: by reducing the overall contact area, they create intense pressure on the small patches of tissue which must carry the weight. The risk of damage at these contact patches is much increased. Worse, women may end up with their bits stuck in the cutaway and chafing. The best way to reduce pressure on your soft tissue is to buy a big gel saddle that spreads the weight and conforms well to your movements. Sommer recommends what he calls a 90° posture--that is, upper body vertical. For practical reasons, he will countentance a 60° posture. Lean any further, and you risk loss of circulation. Padded cycling shorts are a great way to cushion against impacts. 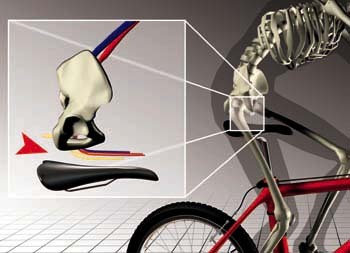 Staying in one position on the bike is likely to interrupt blood flow. Try to find several different positions on the saddle and stand up in the pedals as often as possible. Cycling/impotence studies work from two main angles. 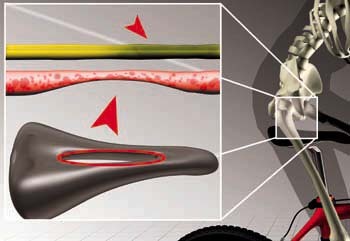 The first deals with microtrauma, the mountainbiker's disease: the effects of repeated shock transmitted through the saddle. The second considers the effects of sustained pressure on genital blood flow and nerve supply. Given its scope, it is disappointing that The Bicycle Saddle Report concentrates on the latter almost to exclusion. We'd have liked some recommendations relating specifically to offroad biking. The report seems to be based on good science. It's impressive to see so many luminaries in broad agreement--although we don't believe that either Simoni or Luperini would go along with Dr Sommer's 60° upper body rule! And it's nice that the contributors don't appear to be in the pockets of big business--in fact, cutaway saddles get such a thorough kicking that the authors might be trying to alienate the manufacturers. Being old and cynical, we couldn't help noticing that Fizik-branded products feature in the film clips on four different occasions. A sharp-eyed observer might recognise a Brooks Pro Select by its unusual rivets, but the Fizik saddles receive several lingering closeups and an endorsement-by-association. However, if this is a case of product placement, it's pretty subtle. No-one mentions Fizik by name. We think that the advice given in the report sounds about right. Fixers already know about changing position on the bike--we stand up half the time anyway. But we aren't sure about big gel saddles. Doesn't squashy gel tend to chafe? It would have been nice to see some results for that Pro Select. We are in total agreement with Sommer's 60° upper body rule. Big whippy frames are the only way to travel. US readers can check the sidebar to find out more about Rivendell's sizing system. UK readers can flag down any cycle tourist not riding an audax bike. BBC News account of the bicycle saddle report. Saddle makers Selle Royal carry more details of the report on their site. Fancy a more upright position? Here's Rivendell on frame sizing. More on saddles and sexual health in our review of Josh Cohen's book.